Dhritarashtra was blind from birth. Unfortunately, he was also bereft of spiritual vision. 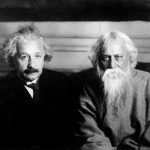 He knew very well that his sons were equally blind in the matter of religion, and he was sure that they could never reach an understanding with the Pandavas, who were all pious since birth. Still he was doubtful about the influence of the place of pilgrimage, and Sanjaya could understand his motive in asking about the situation on the battlefield. Sanjaya wanted, therefore, to encourage the despondent king and thus assured him that his sons were not going to make any sort of compromise under the influence of the holy place. 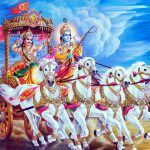 Sanjaya therefore informed the king that his son, Duryodhana, after seeing the military force of the Pandavas, at once went to the commander in chief, Dronacarya, to inform him of the real position. 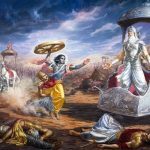 Although Duryodhana is mentioned as the king, he still had to go to the commander on account of the seriousness of the situation. He was therefore quite fit to be a politician. But Duryodhana’s diplomatic veneer could not disguise the fear he felt when he saw the military arrangement of the Pandavas. 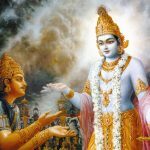 In this way, Vaisampayana reiterates the answer of Sanjaya who could truly understand the blind Dtritarastra’s hidden desire his heart being locked in affection for his sons welfare irregardless of righteousness. Sanjaya then replies that King Duryodhana upon seeing the formidable army of the Pandava arranged in military phalanxes approached Drona his instructor in archery and weaponry and uttered these words. 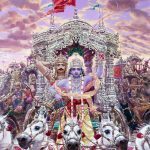 By this verse the alarm within the mind of Duryodhana caused by seeing the might of the Pandava army is subtlety suggested. sañjayaḥ uvāca — Sañjaya said; dṛṣṭvā — after seeing; tu — but; pāṇḍava-anīkam — the soldiers of the Pāṇḍavas; vyūḍham — arranged in a military phalanx; duryodhanaḥ — King Duryodhana; tadā — at that time; ācāryam — the teacher; upasańgamya — approaching; rājā — the king; vacanam — words; abravīt — spoke.